It’s hard to believe that it’s already been five years since Mala and Mantra first launched on February 2, 2014! In that time, our business has grown in so many ways: We’ve welcomed new team members to our family, grown our co-op community, launched countless new collections, made so many wonderful friends + connections in the world of wellness, and expanded our network of incredible customers + supporters that identify with the messages of mindfulness + meditation that Mala and Mantra is all about. We’re so grateful for each + every one of you, and proud of the many things we’ve accomplished together! So before we shift our focus to how we can make the next five years even better than the last, we wanted to take a look back at some of our favorite moments in Mala and Mantra history, as well as the reasons we all love being a part of this beautiful brand. Have a favorite moment? Share it with us in the comments section! Although we had met the artisans at the cooperative for the first time in 2015, this trip was very different. We not only shot and interviewed every artisan at the co-op, but we also went into the main resettlement village where some of them live. Here, we got to see these wonderful women in their homes, and also meet their families and communities. Seeing their humble living conditions was hard, and almost made me feel guilty for what I have in the U.S. But the amazing thing I came to realize was that regardless of their homes—which were constructed with cinderblock walls, dirt floors, corrugated metal and palm roofs—they were very happy. We spent two days with them shooting the video. Many of them are quite shy and uncomfortable in front of the camera talking about themselves. But seeing them open up and get to know them better was incredibly rewarding. I feel so lucky to be able to tell the inspiring story of Mala and Mantra every day, and to spread the messages of mindfulness, meditation + wellness to our customers and fans. It feels wonderful to know that the products we create actually make an impact on people’s lives and sense of well-being. I’m particularly proud of the work we’ve been able to do over the last several years through our Crafted With a Cause program. Each year, we choose a different non-profit partner and design an exclusive collection to benefit the organization. Past partners have included the Cabo Hurricane Relief Fund, Wellness for Cancer and the Center for Mindfulness. 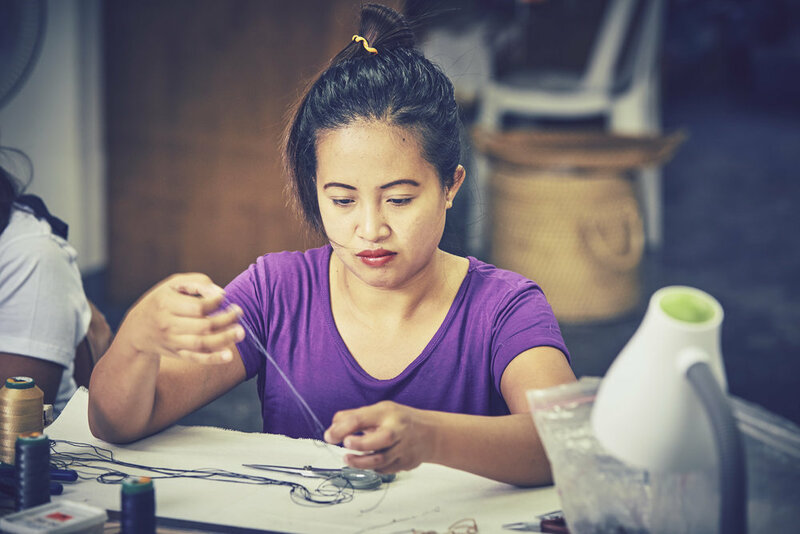 I feel very blessed to work for a company who prioritizes giving, whether it’s through donations to causes like these or providing our fair trade artisans with full-time jobs. It’s rewarding to part of brand that’s on a mission to make the world a better, happier, kinder and more mindful place. Not only are our pieces visually beautiful, but so many of our customers also purchase a specific piece because it "speaks" to them or carries a property or energy that they are seeking in their life. When I have the opportunity to interact directly with our customers, it's very rewarding to hear their stories and know that Mala and Mantra—and the powerful story behind the brand—has such a positive impact on them or someone they know. Back in 2015, we did a photo shoot for some of our core collections (including Mantra Gemstone), and it was one of my favorite moments from my time here at Mala and Mantra. At the time, I was the only employee and our company was so small that we didn't even have a budget for models. So I became the model! Judy's longtime best friend offered her home as a photo shoot setting, and one of her employees did my makeup really beautifully. Wardrobe was provided and there was a small team around me to help with styling during the shoot. It was a lot of fun for all of us, and at the end we had a proper wrap party by the pool. We have certainly come a long way since then, and although it’s been so rewarding to see how the company has grown, I always love thinking back on the scrappy start-up moments! I feel honored and so blessed to work for a company where each piece of jewelry is designed with intention and helps empower people to find their true calling. It’s so special to work alongside a team of smart, powerful, talented women, and know that our work has an impact on so many lives across the globe.